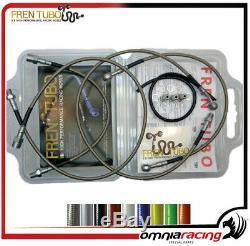 Hoses brake kit 1 frentubo triumph street triple r 675 2009/2011. Number of hoses in the package: 3. Brake hoses aeronautical kit for motorcycle frentubo type 1. The kit is complete with steel reinforced teflon tube with transparent coating and sheath, fittings and pins in stainless steel (unless specified otherwise). The brake hose kit is complete with all mounting bolts and bolts and includes both front and rear hoses and fittings, complete with fittings, bolts and gaskets. The fren tubo kit eliminates the annoying "lung" effect during motor braking, thus improving the power and sensitivity of the front and rear brakes. Aircraft brake tubes significantly improve the braking system of the bike. Designed for specific use in supersport, supersport, motorcycle 2, motorcycle and motogp, this type of hoses has a remarkable yield and is an important change to be made to any kind of motorcycle brakes. The kits are specially designed for the specified bike, so are not tilted, all are tuv and dot certified. The kit includes the mounting kit, where applicable, the installation instructions. The hose may be required in the following colors. Technical specifications for kit type 1. Stainless steel braid hose with external sheath and steel fittings with nickel zinc treatment (din 50021-s standard: 480 hours without red rust appearance). Conforms to fmvss 106 standards. Minimum burst pressure: 827 bar. In the case of racing brembo or accossato racing aftermarket radial pumps it is necessary to be indicated in the notes of the best brands of the brembo, castrol, motul type, taken from a sealed bottle. We do not recommend using dot 5 or dot 5.1 as they are perfectly compatible with frentubo but they are not compatible with the gaskets of most. Brake / clutch tube kit no "standard\The tubes are a safety device and can only be installed by qualified personnel. In 1994, the passion and experience of manufacturing bertollini created omnia racing, with the aim of representing a reference point for everyone fond of bikes. In 2000, when the company joined the competition, the company was founded, a society based on the passion and competence needed to create and trade the top products for motorbikes. Our continuous search for perfection and performance, using advanced technologies, has allowed us to interact with internationally recognized pilots and teams. This should allow our customers to feel at ease. All this has not been a decade ago, a reference point in italy; In addition, our products are in demand in Europe and in the United States. The item "brake hose kit 1 frentubo triumph street triple r 675 2009/2011" is on sale since Wednesday, February 7, 2018. It is in the category "auto, motorcycle parts, accessories \ motorcycle \ spare parts \ brakes, suspension \ brake lines, pipes ". The seller is "omnia-racing" and is located at / in it. This item can be delivered anywhere in the world.